First, a disclaimer. This is not the first time I’ve interacted with a Heinz ketchup bottle using my cell phone. Seems strange? I’ll tell you about that time further below. I know you may find that a bit odd. But let me tell you why it’s GENIUS. Let’s take a look at how Heinz incorporates many of the same strategies I always recommend to my own clients. This one I tend to repeat until people get tired of hearing it. I don’t use ketchup often at home. Every now and then when we cook hamburgers or hot dogs maybe (I’m vegetarian so even those are really for the males in the house). If I do whip the tomato goodness out to douse some french fries, I’m often putting it right back in the fridge and not really paying attention (but I know my most recent bottle didn’t have this label – it was special for restaurants). Pretty much the only time I really see a bottle of ketchup is when I’m sitting at a restaurant. The only time I really pay attention is when I’m somewhat bored, waiting for the wait staff or food or whatnot. You know, the times when you tend to touch the things on the table. I always check the Heinz bottle now, ever since the first time (more on that below). And so this time when we were out for breakfast for my husband’s birthday, I looked at the bottle of ketchup to see what Heinz was up to. And they’re up to GENIUS. The marketing is targeted to where the customer already is. I’m at the table using ketchup, and they’re marketing to me right there. No need to pay a lot of money on special advertising to try to find me on TV or the radio or online or anywhere else – they already have a captive audience who is likely interested in the product. Not only are they marketing to me where I already am, but they’re including social proof marketing. The label tells you to take a selfie with the bottle. On the back label which I didn’t include, it tells you how to text the photo to them, and how to post it online using their specific link. Social proof is one of the strongest marketing tactics a business can use – having other people talk about how great the product is, or show themselves using it, etc. And Heinz has built it into this particular marketing campaign. I posted it on my Facebook (I didn’t use the link, I talked about how genius the campaign was lol). So now all of the people who are friends with me see me holding a bottle of Heinz ketchup. Believe me, I don’t endorse products randomly. I only post things that I truly use and love. So my friends seeing a bottle of this ketchup in my hands says something to them (I think). And Heinz didn’t even have to pay me to do it! Not only does Heinz do a great job of carefully targeting their customer marketing and tying in social proof, they also have included cause marketing. To encourage you to take a selfie, on the back label it says how Heinz is donating $1 to a hunger organization if you text the photo to them (I don’t remember which one so if you know please comment) and I always try to support causes that fight hunger, so I was in. This interest in social responsibility by a business is especially strong among millennials, and this cause ties right into Heinz’s business since they make food products. After you’ve texted the photo to them, they go further and tell you if you share it and use their specific link or hashtag (again I don’t have the label in front of me), they will donate an additional $.57 to the organization! 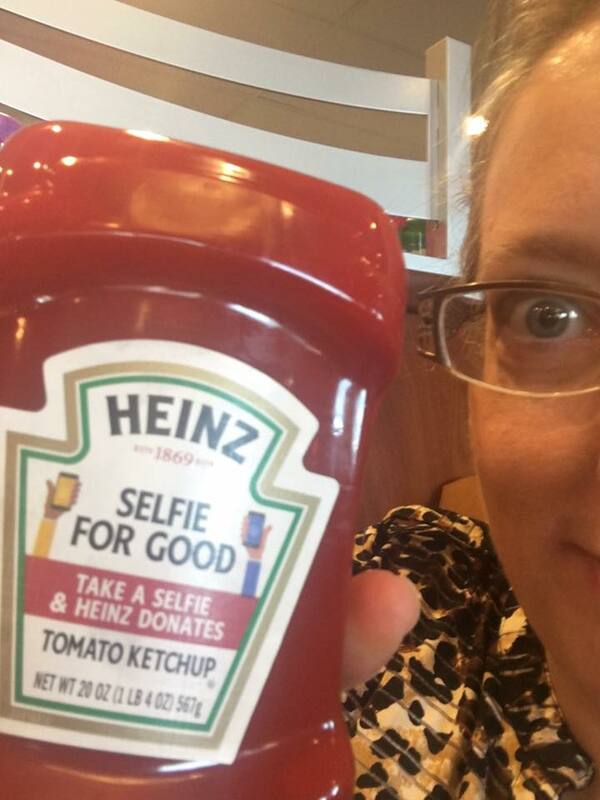 Take a selfie with the Heinz Selfie for Good bottle at participating restaurant locations. Share your photo using the link in the reply message and Heinz will donate an additional $.57. By the time I had texted my photo in to Heinz, I received an automated message back saying how they had already reached their donation goal, gave me a link where I could still make a personal donation. What that means is that they had at least 200,000 people text their selfie to Heinz or share it with the hashtag on their social media (Facebook, Instagram, Twitter, etc). How would you like over 200,000 people marketing your business for you? Several years ago, I was at Riscky’s BBQ in downtown Fort Worth (this is when I still ate meat!) waiting for my husband so we could eat some of their all-you-can-eat beef ribs (the best!). I was a bit bored waiting, and being an avid reader I was reading all of the bottles on the table. (There you go, a description of my entire life wrapped up in one sentence). The ketchup bottle – Heinz – had a QR code to scan. It was an enter to win, I think they had 5 winners who would each win a recycled plastic eco-friendly bench. The marketing, if I remember correctly, was something tied around Earth Day or similar. I scanned the QR code more to see what happens after (being the marketing geek that I am), checked it out, and didn’t give it another thought. Until I received a letter in the mail telling me that I had won. And what they were doing was sending a $500 gift card to Lowe’s where I could purchase the bench myself. How did they know I love Lowe’s?!? I could spend HOURS there! I ended up spending the gift card on a few other eco-friendly things instead (I already had two benches and no where to put a third). If we could all be so wise! Want to see how you may be able to up your own marketing game and implement some of these strategies? Book your free marketing strategy session and let’s see if we can’t brainstorm an idea or two! This entry was posted in Hacks, Tips and Tricks, Marketing Case Studies. Bookmark the permalink.